Red curry paste is a good all-purpose paste used in many curry dishes as well as a seasoning ingredient in other dishes. If you want to make your own, this is a shortcut version. Place dried chilies in a bowl and cover with hot water. Soak for 25 minutes, or until softened. Drain, reserving 3 tablespoons of soaking water. In a food processor or by using a mortar and pestle, combine lemongrass, fresh chilies, garlic, shallots, galangal (or ginger, if using) cilantro, coriander, lime zest, cumin, pepper, salt and reserved soaking water. Blend to combine. Add softened dried chilies and process until a smooth paste is formed. Add a small amount of water if paste does not come together. Scrape down sides of the bowl, as necessary. Transfer to a clean container and cover tightly. Curry pastes can be covered tightly and refrigerated for up to 3 days or frozen for up to 3 months. 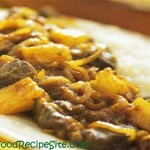 Transfer curry paste to a small resealable freezer bag and flatten. Freeze.To use, break off the required amount and seal the remaining paste tightly. Alternatively, place the paste in mounds (about 1 tbsp/15 ml each) on a parchment-lined baking sheet. Freeze, then wrap each mound tightly and store in a resealable plastic bag. 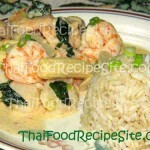 Have You Tried These Other Curry Recipe Thai?